Dueling Darts | Where AIM is EVERYTHING and GETTING HIT IS NOT AN OPTION! Where AIM is EVERYTHING and GETTING HIT IS NOT AN OPTION! 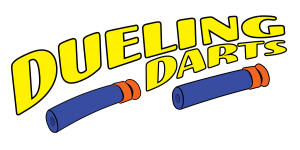 Contact us now for any questions or to schedule your Dueling Darts Play Session! We are a family owned company providing recreational entertainment for ages 7 and up. Below are details about what services we provide, our hours of operation, and pricing packages. If you are interested in setting up a session or just need more details, give us a quick call. We are open for private party reservations, 24 hours / 7 Days a week. Some Holiday Restrictions May Apply. Contact us for details. We provide 90 min or 2-hour party sessions for ages 7 and up. Facility available for private or corporate parties. Outside food and beverages are welcomed and encouraged.